Getting a look at the first featured tournament, the Main Event comes with a PHP 10 Million (~US$188,500) guarantee. It runs a course of five days from November 28 to December 2. With its highly crafted deep structure, this is revered as one of the top events to play in Asia. Last September in the Philippines, the series saw 306 entries for a prize pool of PHP 14.8 Million. For a buy-in to of PHP 55,000 (~US$1,040), players start off with a very healthy stack of 500x the opening big blind; levels increase every sixty minutes. Two starting days are offered with late registration closing at the start of Level 10 in Day 2. The past edition of the series saw local pro Lester Edoc successfully defend his Philippines Main Event title capturing back-to-back series victories. The second main feature is the Championships Event which also extends a PHP 10 Million (~US$188,500) guarantee. It runs immediately after the Main Event covering a total of four days from December 3 to 6. Unlike previous versions, only one starting day is offered however late registration still closes at the start of level 10 in Day 2. Alike the main, this is another APT custom designed deep structured tournament with players starting off with 500x the opening big blind; levels also increase every sixty minutes. With the buy-in much higher than the main, PHP 165,000 (~US$3,110), the Championships Event tends to see a field packed with top pros. The Main Event and Championships Event are the most prestigious tournaments of the APT and are definitely the events “not to be missed”. For those looking to try to join in at a lower cost, three satellites per featured event are offered. Resorts World Manila is also running guaranteed satellites to the Main Event every Sunday in November. The Monster Stack event is a highly popular APT event and with PHP 2 Million (~US$37,580) guaranteed, it will likely draw a very big field. This is a two-day tournament running from December 5 to 6. Buy-in is PHP 27,500. (~US$517). 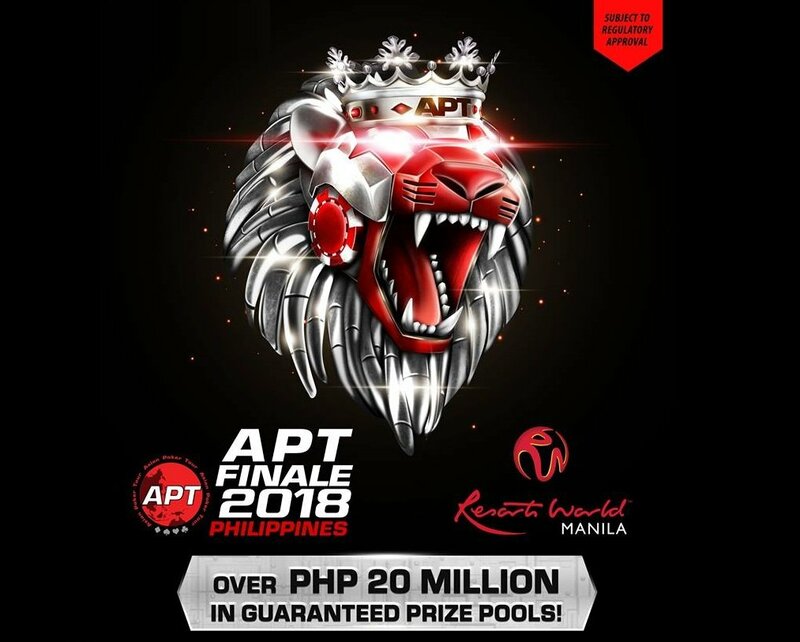 Kicking off the series is the APT-RWM Opening Event with a PHP 1 Million (~US$18,790) guaranteed prize pool. Event runs on Tuesday, November 27 to conclude on the following day. Buy-in is PHP 11,000. One of the most enjoyable events in the lineup is the MegaSportsWorld Deep Stack Turbo. This fast paced game begins in the early evening and wraps up in just several hours The event comes equipped with a PHP 1 Million (~US$18,790) guarantee which players can win a nice chunk of for a buy-in of just PHP 5,500 (~US$103). Event takes place on Saturday, December 1. 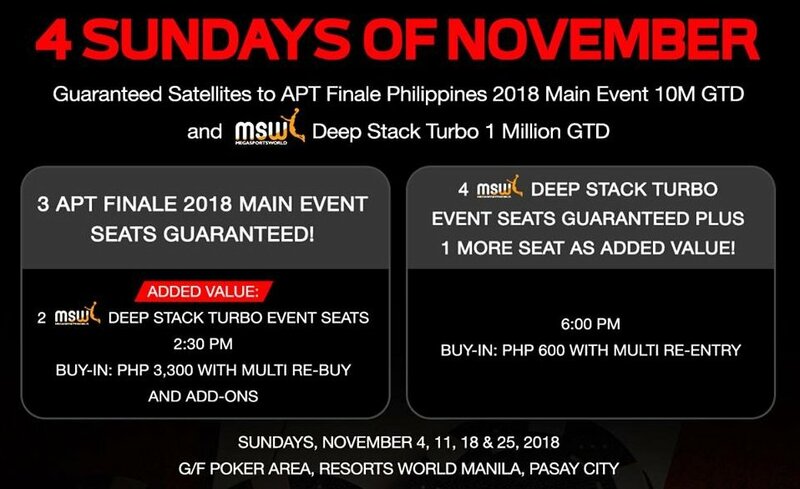 Seats to this event can also be won via Resorts World Manila’s guaranteed satellites running every Sunday in November. In addition to the guaranteed events, the series comes with a variety of games for every type of interest and bankroll. Buy-ins range from PHP 5,500 to PHP 500,000. Among the low to mid range buy-ins are the Turbo events, NLH events, Short Deck, Shot Clock, and Pot Limit Omaha Hi event. Depending on the event, some can run up to two days. For heavy wagers, there are several games to keep you busy right from the get-go. Three High Rollers events are lined up and a Super High Rollers. *Important note: All APT events utilize the Ante Big Blind format. The post Asian Poker Tour season finale at Resorts World Manila with PHP 24 Million in Guarantees appeared first on Somuchpoker.